Anatoly Karpov from the Soviet Union was the World Chess Champion from 1975 to 1985. Throughout his career, Karpov has established chess schools in several countries and been a strong proponent for in-school chess programs. He has also been involved in programs where prison inmates are given a chance to learn and play chess. Karpov has been an UNICEF ambassador and served as chair of the International Association of Peace Foundations. Anatoly Yevgenyevich Karpov was born in Zlatoust, Soviet Union on May 23, 1951. He learned to play chess when he was just four years old. After showing an aptitude for the game, he entered into the Soviet “chess system” and received extensive training from skilled Soviet chess players. Karpov won the World Junior Championship in 1969. At the age of 19, he became a grandmaster. Fischer however, refused to play against the challenger unless a long list of demands were met, and eventually the World Chess Federation (FIDE) stripped Fischer of his title and gave it to Karpov. Karpov thus became World Chess Champion without actually playing against the reigning master. In 1978 and 1981, Korchnoi – now a defector from the Sovit Union – challenged Karpov for the World Chess Champion title, but failed to best the reigning champion. In 1984, Karpov was challenged by fellow Soviet player Gary Kasparov. The struggle between Karpov and Kasparov turned into a prolonged event, comprised of a series of games spread out over five months. Eventually, the World Chess Federation (FIDE) suspended the tournament, citing concerns for the health of the two players. Since no winner was declared, Karpov kept his title. In the 1985 World Chess Championship, Karpov was defeated by Kasparov. The two faced off again in 1986, 1987 and 1990 – with Kasparov retaining his title each time. In 1993, the title of World Chess Champion was given back to Karpov, but only because Kasparov had left the World Chess Federation (FIDE) to form another competing international chess organization. 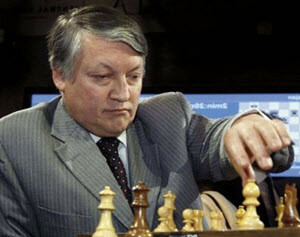 Karpov remained FIDE World Chess Champion until 1999. Karpov remaining loyal to FIDE, and in 2010 he ran for the presidency. Despite the support of many national chess federation that endorsed Karpovs anti-corruption platform, he ultimately lost to FIDE’s sitting president, Kirsan Ilyumzhinov. Worthy of mentioning is the fact that Kasparov supported Karpov’s run for FIDE presidency. During recent years, Karpov has focused mainly on promoting chess, chess programs and chess schools around the globe, but he has also continued to play competitively. In 2012, he won the Anatoly Karpov Trophy, which had been named in his honor.